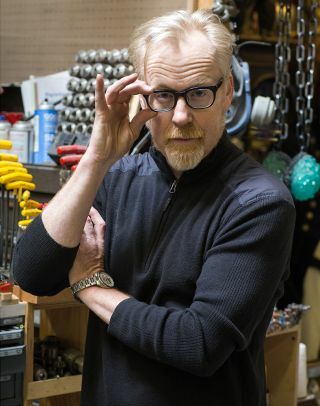 Adam Savage, co-host of the Discovery TV show "MythBusters," hosts Syfy's new 15-part podcast, "SYFY25: Origin Stories." Happy birthday, Syfy! The science-fiction network turns 25 this month, and it's kicking off a monthlong celebration with the release of a new podcast called "SYFY25: Origin Stories." Hosted by Adam Savage, co-host of the hit Discovery TV show "MythBusters," the 15-part podcast features deep discussions with some of the biggest names in science fiction. Guests include prominent science-fiction writers like D.C. Fontana, a longtime scriptwriter for "Star Trek," and Ron Moore, the Emmy Award-winning screenwriter known for his work on "Battlestar Galactica." Several of the creative forces behind "Star Wars" also join the conversation, including Frank Oz, the puppeteer and voice of Yoda. If you haven't been keeping up with the world of science fiction recently (or ever), don't worry — you don't need any knowledge of science fiction to understand, appreciate or at least laugh at the conversations in these podcasts, Savage said. Whether you're a die-hard science-fiction geek, a "MythBusters" fan or simply a lover of science and space, "you're going to find something in these podcasts," he said. "Our goal is not to just preach to the choir." However, "MythBusters" fans should be warned that no myths were busted in the making of this series. "I didn't set out with any of the questions or any of the interviews to bust any myths, but if there was a single myth busted by the entire slate of interviews, it's that science fiction is not a culturally important genre," Savage said. "That is a complete myth." The new podcast also brings some humor to the conversation of science fiction and its role in culture and society. Comedian and TV-show host Chris Hardwick, who was once a roommate of "Star Trek: The Next Generation" cast member Wil Wheaton, guest stars in an episode of the podcast. David Cohen, a writer for "The Simpsons" — which isn't exactly science fiction — also joins Savage for some sci-fi discussion. All 15 episodes of the podcast will be released tomorrow (Sept. 8), and you can listen to them on Syfy.com or through a number of third-party podcast players.